Admittedly, to draw Google's attention towards your blog first and foremost you need plenty of decent and niche content but to really go anywhere with your blog it is of utmost necessity that you pay due attention to SEO and optimize your content for at least the most popular search engines like Google Yahoo and Bing. One of the easiest way to get noticed is by choosing the proper keywords for your post. Alternately, after you decide upon the broad general topic you can do some quick keyword research and phrase your article accordingly. It is a very simple keyword suggestion tool where you simply need to type in a query and then select a language as well as a search field (such as images, news, recipe or web) and it will generate a list of relevant and related keywords. 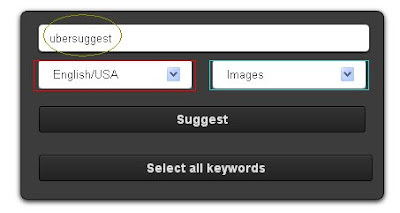 You can choose as many of the suggested keywords as you want and Ubersuggest will create a list of the keywords which you can easily copy and paste in the "tags" field of your post. It's that simple and of course free! However, its simplicity unavoidably leads to lack of features. Most notably Ubersuggest gives no hint as to the competition for each keyword as well as its CPC value. Another thing you must remember is that many blogging platforms (including Blogger) requires you to separate keywords by commas. Ubersuggest's listbuilder doesnot do that. So you must remember to enter the commas manually. Overall Ubersuggest is a simple and fast way for newbie bloggers generate a handful of relevant keywords without having to wrack your brains. Nothing more nothing less.